Located at the far western tip of Texas, the city of El Paso is bordered on the north by New Mexico and on the south by the city of Juarez, Mexico. The area's recorded history dates back more than 400 years when Spanish missionaries gave the region its name: El Paso del Norté, or The Pass of the North. Between 1850 and 1950, El Paso's growth was influenced by a variety of people and events. The "four dead in five seconds" shootout in 1881 gave El Paso the short-lived nickname "Six-Shooter Capital" until the Gunfight at the O.K. Corral in Tombstone, Arizona, happened later that year. When the railroad arrived, El Paso was abruptly transformed from a sleepy, adobe village to a vital international crossroads. The Mexican Revolution influenced the city in the early part of the 20th century, and the 1920s saw Prohibition energize the local tourist trade with barrooms and gambling available just across the border. El Paso also became an inland Ellis Island, with thousands of immigrants entering the United States eager for a new start. 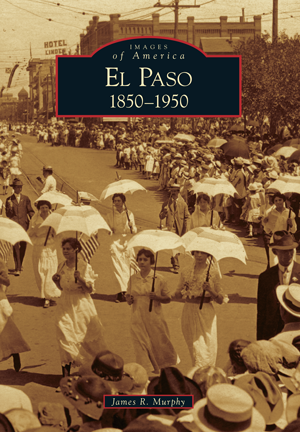 This book examines the early years of El Paso's evolution. Author James R. Murphy is the director of development for the El Paso Museum of History. Along with the assistance of many individuals within the El Paso historical community, Murphy has created this early pictorial history of the region by showcasing more than 200 vintage photographs.